For a data center like the MGHPCC, energy efficiency means minimizing the amount of non-computing “overhead” energy used for cooling, lighting, and power distribution. Energy modeling during the design phase estimated a 43% reduction in energy costs compared to the baseline standard (ASHRAE Standard 90.1-2007), and a 44% reduction in lighting power density for building exteriors below the baseline standard (ASHRAE Standard 90.1-2007), with overall savings yielding a 30% reduction in carbon dioxide equivalent emissions. Operationally, this has translated to a state of the art Power Usage Effectiveness (PUE). Learn more about energy efficient design at the MGHPCC. 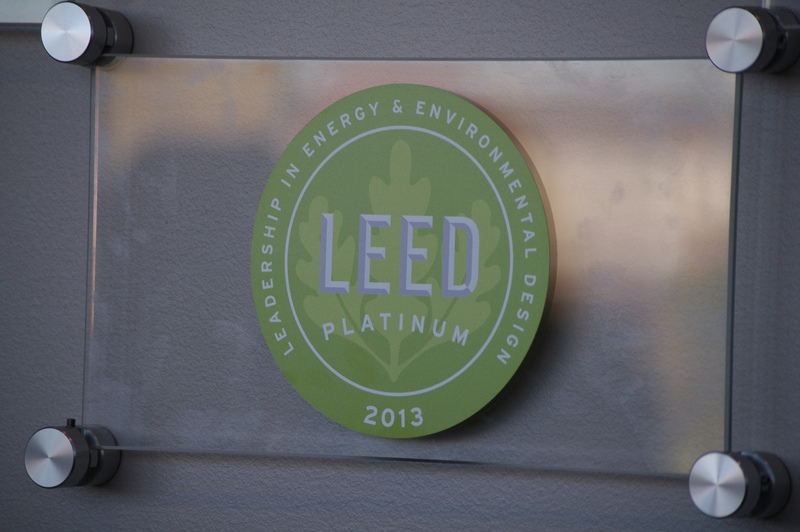 A second major requirement for LEED certification seeks to reduce negative environmental impacts. As the MGHPCC LEED Certification Review Report shows, environmental design for LEED Certification requires attention to numerous details, including construction methods and materials, landscape and site design, and water conservation. For example, 97% of the construction waste generated while building the MGHPCC was recycled or reused instead of going to landfills; materials high in recycled content were used wherever possible, and landscaping was designed to minimize water use and storm water runoff. Learn more about design for low environmental impact at the MGHPCC.